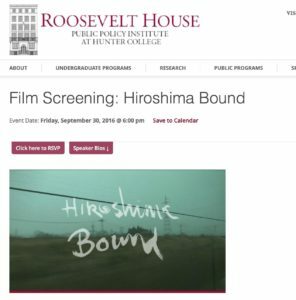 I am pleased to announce that my film Hiroshima Bound will be screening at Hunter College’s Roosevelt House Public Policy Institute under the auspices of the Hunter Human Rights Program. The screening will be followed by a discussion with Professor Yukiko Koga from the Hunter College Department of Anthropology. This is an RSVP event. If you are in New York, please come! between Park Av.and Madison Av.